Kick Back, Relax, and Catch a Wave! This is your ideal vacation spot and a true piece of Paradise! Enjoy a lazy day on the sugar white sand and playing in the aqua green waters of the Gulf of Mexico; the most beautiful beach in the world. Or delight in a day by the pool with the kids as they play in the pool, kiddie pool and splash area. Our Mainsail condo is a beach front building and offers views of the beach and the pool area! From the kitchen and bathroom renovations, to the beach flare décor, our clean, luxury condo has much to offer. -	BEACH SERVICE, one umbrella and two chairs, INCLUDED in your rental and waiting for YOU! -	Unit 223 is 3 doors from the beach, second floor, with easy access to the beach. -	Spectacular unobstructed view of the Gulf from the living area and balcony. -	Newly renovated custom kitchen with granite topped island. -	New Stainless appliances and fully equipped kitchen. -	King Master with direct access to the balcony, walk-in shower, and comfort height vanity. -	Guest bedroom with queen bed and direct access to bathroom. -	3 Flat Screen TV’s, DVD Players, Ipod Docking Stations (living area and bedrooms). -	Queen Sofa sleeper allowing for a total of 6 guests; extra linen and pillows provided. -	Full size washing machine and dryer. -	Surf the Web – WiFi Internet in unit and on balcony. We require all guests to read and sign OUR rental agreement and terms for our condo. Payments and cancellation information is stated in our rental agreement. Any questions please contact Michele “Mickey” Rodriguez. AND, if you seek additional amenities, Mainsail offers a fitness center, lighted tennis and shuffle board courts, basketball goals, 2 pools (one seasonally heated), and outdoor hot tub! Poolside grills (gas and charcoal) are available for family cookouts. Covered parking and 24/7 on site security. Or you can enjoy some of the best restaurants in the south and water sports activities (available for a fee) on the beach. Mainsail is conveniently located across from the South's highest volume outlet mall... Silver Sands, Starbucks, and Winn Dixie Grocery. Other family activities close by are: golf, miniature golf, The Track Amusement Park, Big Kahuna's Water Park, Baytown, The Harbor, Gulfarium, Chartered deep sea fishing, parasailing, Dolphin Cruise and more. Our reviews are worth the read. They tell the stories of what our previous guest found attractive. All agree, once you stay with us, you will want to come back often. Our condo is a No Smoking unit. Mainsail prohibits guest from bringing pets. All you need is to pack your suitcase. The grocery store is in walking distance. If you want to be sure of a great vacation that everyone will talk about for years to come...contact Mickey Rodriguez. Herbie and I are both born and raised in the metro New Orleans area. We love our city as much as we love going to the beach. 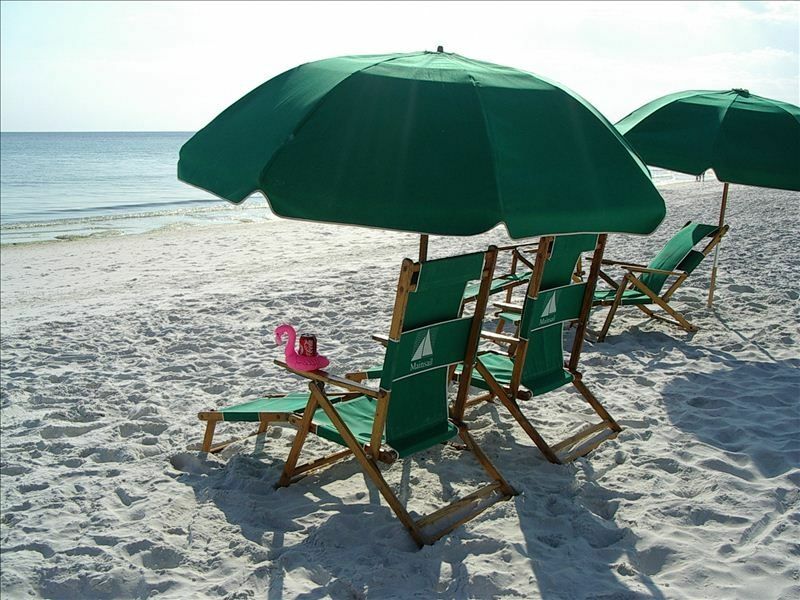 Because we are only 4 1/2 hours away, a quick get away to Miramar Beach is a wonderful treat. We are fortunate to be able to spend at least one long weekend a month in our second home, and by doing so, we are able to make sure our condo feels like home to our guests. We take pride in our condo and our personal service hoping our guests will want to return to what we affectionately refer to as our "happy place". My husband, Herbie, and I purchased our condo in the summer of 2010. We weren't in the market for a second home / condo on the beach, it just happened. We had been going my sister's condo at Mainsail for over ten years for the July 4th week , and out of curiosity, checked what was for sale there. When we saw the view from this unit, we knew we wanted to become owners. Mainsail is relaxing, easy and the best kept secret in Destin. We have always felt Mainsail was very family friendly. The beach is wide and private, providing everyone a beach front view even on the busiest weeks of the year. Mainsail is located directly on the beach. Once you stay here, you realize that it is a hidden gem as there are no roads to cross to get to the beach. Mainsail has many amenities, lighted tennis and shuffle board courts, basketball goals, hot tub, 2 pools (one seasonally heated), a dedicated kiddie pool, charcoal and gas grills in the pool areas, a fitness center, and an entertainment room. 2 Pools - 1 heated, Hot Tub/Jacuzzi, Exercise/Workout room, Dry Sauna room, Outside Gas BBQ, Video Game Room, Tennis courts, Shuffleboard. Wi-Fi connect.